Brief Description: The sitcom has proved to be one of the most enduring genres in British TV history, reflecting the social changes and national concerns of the time, and has brought many memorable and much-loved characters to our screens. Who can forget iconic figures like Frank Spencer, Basil Fawlty and Reggie Perrin or the antics of the Trotters, the Meldrews and the staff of Grace Brothers’ department store, to name but a few? The 1,000 questions in The British TV Sitcom Quiz book will test your knowledge of your favourite series from yesteryear to the current day. From Steptoe and Son, Dad’s Army and Porridge to Absolutely Fabulous, The Office, and My Family, this book is bulging with facts that will refresh your memory and help you to recapture some of those magical moments in situation comedy. With a fitting foreword by Brian Murphy from the hilarious ‘70s TV show George and Mildred and Nicholas Parsons OBE, this is a must-have book for all sitcom fans. About the Author: Chris Cowlin is an author, actor and entrepreneur. Born in London in 1980, Chris has achieved a great deal in a short space of time. With a background in printing and advertising, Chris owns a successful publishing company and is himself the author of 128 books. Chris has written on a range of subjects but specialises in football, sport, television and music. His books have been endorsed by many celebrities and sports personalities such as Jonathan Ross, Sir Alex Ferguson, Gary Mabbutt and Gary Lineker. His writing credits include a foreword for a book by notorious criminal, Charles Bronson, who Chris visited in prison on two occasions. He is also a regular contributor to The Sun, Daily Mirror and the letters page of local newspapers. As a lover of sitcoms - well, the classic ones - this book would make the ideal present. Extensive in its content and well-planned in its design and approach, it's an ideal companion when you have a few minutes or hours to spare. A fascinating piece of work. Forget UK Gold, Chris Cowlin has created a real gem of a trip down British Comedy's memory lane with a quiz book that will leave you laughing out loud and scratching your head at the same time. All the classics are included as well as one or two that have slipped by the wayside but the memories will soon come flooding back with the turn of the first page. Great collection of teasers and a must for anyone who likes classic British comedy - so that's all of us! From Father Ted to Some Mothers Do Have 'Em; To The Manor Born until Death Do Us Part, ‘The British TV Sitcom Quiz Book’ will really stoke your memory as it takes you on a trip down memory lane. This splendid book is for all generations. Are you one of those people who sits glued to the televisiona nd never misses a TV sitcom? 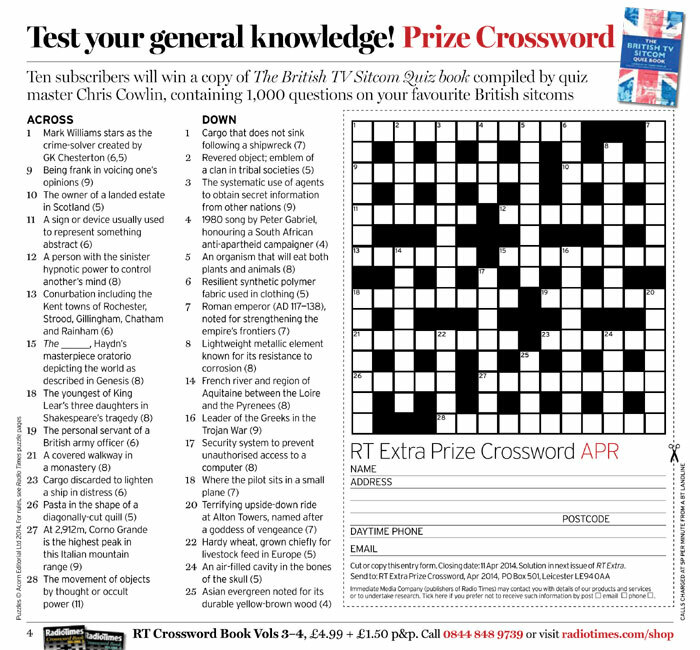 You now have the chance to check your knowledge against a fantastic new book called The British TV Sitcom Quiz Book by Chris Cowlin. You will find yourself goggle-eyed and fascinated with more questions and answers than you could have imagined possible. An essential and entertaining quiz book, which will test the best. 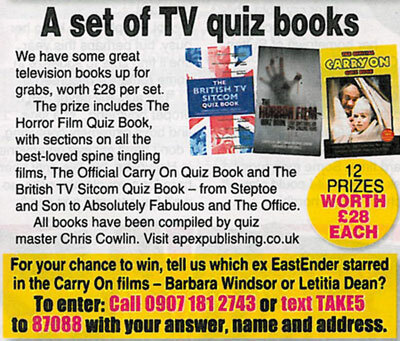 A quiz book with difference, a must for TV addicts and TV anoraks. My only sitcom was SORRY! for the BBC with Ronnie Corbett. This book is a great resource for telly addicts and quiz setters! If you know the answers to all these questions you really should get out more! A great set of questions, fun for all the family. A must for all telly addicts! I'm sure this book will have even the most die-hard sitcom fans racking their brains. I grew up watching all these great shows; 'Allo! 'Allo!, Only Fools and Horses, Hi-De-Hi, The Young Ones and the like. Anyone who loves the good old British sitcom as much as I do will get a lot of enjoyment out of this book. I love it! If you enjoying watching sitcoms then you must be a person who likes having fun. If you like having fun, then you will love this book. It brought back many memories of some the greatest shows of all times, and made me laugh as I remembered them. I could watch the old sitcoms again and again and again, as with this book, I just keep coming back for more. The book is great for holidays, train journeys, and would make the perfect present. (Photo: Linda Regan and her husband Brian Murphy with a copy of 'The British TV Sitcom Quiz Book'). 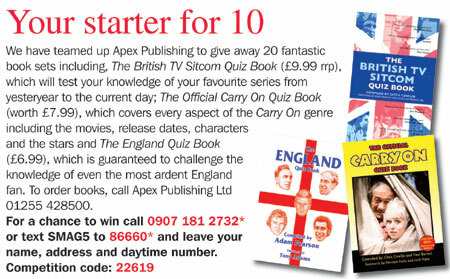 Experience once more the joy of British Comedy through this must have TV sitcom Quiz Book. Remember those quirky characters, famous storylines and the creativity of gifted writers and directors. This book will have all age groups searching the corners of their mind to find answers which both irritatingly and histerically sit on 'the tip of your tongue'! A book with the potential to provide hours of family entertainment and to wallow in the fabulous institution we fondly identify as good old British Comedy. Once you start puzzling over these questions you won't be able to stop. Fiendish, funny and fascinating. If you think you knew everything about British TV Sitcoms well here is your chance to prove it. 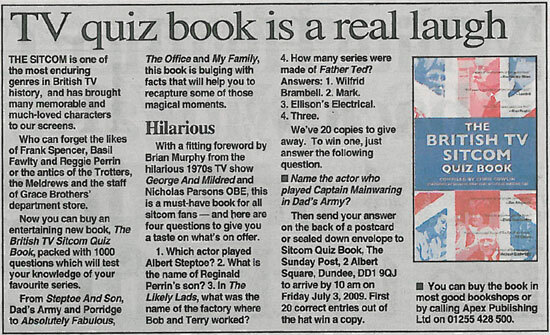 The British TV Sitcom Quiz Book will tax your brain with 1,000 questions on different TV series. This book - a must for all TV addicts - will prepare you for any quiz on TV Sitcoms you are likely to encounter. I recommend it wholeheartedly. You will find this comprehensive book difficult to put down. Its all there from Only Fools to Fawlty Towers. Hours of amuzement (literally) in the pages of a book. Nobody can know everything. But this book is a good start. Chris Cowlin has compiled the best of british sitcom comedy in this quiz book - covering six decades from Hancocks Half Hour to The Office, it's all here. A well researched and presented book, you'll be amazed! A must for all television lover's and sitcom comedy fans. My brain still hurts from reading all the questions! This is going to end up with all kinds of anorak arguments! The British have always produced the best and most entertaining situation comedies. Unfortunately as production costs have increased and reality shows have become very popular, we are creating fewer memorable shows in this genre. The best British comedies have always been based on character, as opposed to American sitcoms which are usually based on types, individuals who are easily recognised by the vast American audience to which they must appeal and the comedy usually arises from the clever dialogue the performers deliver. In this country we have such a large diverse cross-section of distinctive and unusual individuals who in their own way are very British that our skilled comedy writers build wonderful situations around such characters. We recognise them, though they are slightly larger than life, and when the roles are performed by the great comedy actors this country produces you have wonderful situation comedy. Take the example of that classic show DAD’S ARMY. A group of very British characters put in an unusual situation by clever writing, then superbly performed by skilled actors and you have a timeless comedy. When you recall the great British sit-coms there are a number which immediately spring to mind, and the proof of their success and popularity is that they are regularly repeated on our television screens. They are nearly all based around a wonderful British character superbly performed. PORRIDGE with the incomparable Ronnie Barker as the wicked, wily and conniving Fletcher. Also his equally creative performance in OPEN ALL HOURS, which also featured that other great comedy performer David Jason. His brilliant creation in ONLY FOOLS AND HORSES guarantees its constant repeats. It would take too long in a foreward to list all the great British situation comedies that have been created over the years and name the stars that helped to make these shows famous. Anyway most of them will be listed in this book. I will finish by mentioning a more recent comedy which has achieved great success and proves how creative we can be in this field of entertainment THE VICAR OF DIBLEY. The show proves all the points I have been trying to make. A simple but delightful setting, a cast of wonderful British characters, all a little larger than real life, but whom we recognise as typically British, played by first-class comedy performers, and the whole show revolving around a superb creation of the writers an attractive female vicar played with style and comic panache by the engaging and highly talented Dawn French. In closing, Britain has always produced the best situation comedies. Most of these are based on characters we immediately recognise and with whom we can identify. These characters become much loved and fondly remembered, so a quiz book based on them and the situations in which they have been involved, must be a winner and popular with all television addicts. That's you lot not the Norwegian wartime collaborators. In our dotage we wish you all the very best in answering these ... what was the question again? Oh yes, quizzes. Suffice to say that when we were asked questions on the collected work of Galton and Simpson we managed to get five out of ten right. So good luck to you. If you like questions about sitcoms then you'll love this book because it's full of questions about sitcoms. The ultimate brain teaser, be careful how you use it! I was completely engaged and found it thoroughly researched. I think it will appeal to a wide range of readers as it spans across a broad spectrum of British Sitcom titles over the years. There is plenty to engage everybody’s interest and keep them entertained for hours. A true Mastermind of a book – Absolutely Superb! Great fun for square-eyed TV addicts and none-addicts alike! 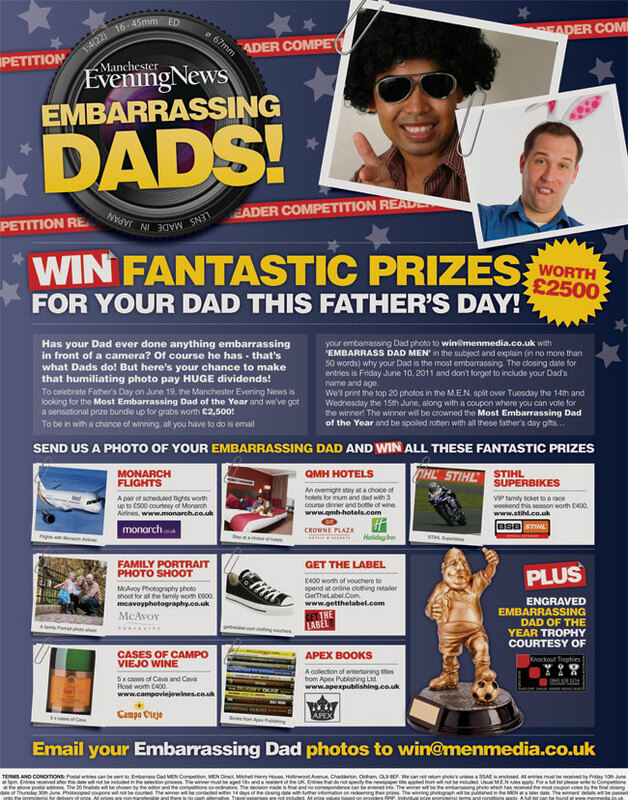 My dad and I were in competition doing The British TV Sitcom Quiz Book. 'Listen Carefully, I Shall Only Say This Once,' said Dad, 'This is far too tricky for you.' Is He Having A Laugh? I thought. I said, 'Nay Nay And Thrice Nay, you see I Have A Cunning Plan. If I can't answer something I'll ask you. 'You Stupid Boy,' he said. I Don't Believe It, he was right, I Know Nothing! I was fortunate enough to have appeared in what is now often regarded as the Golden Age of television sit-coms during the 70s and 80s. In Man about the House and George and Mildred regular viewing figures were over 20 million for each episode. Those programmes were never out of the top five- proving how television viewers enjoyed laughing at good family entertainment. They were happy times and Thames TV was responsible for offering the nation some of the very best in light entertainment. For me there was also the pleasure of working with the brilliantly talented Yootha Joyce, Richard O'Sullivan, Paula Wilcox and Sally Thomsett, we had many laughs on and off the set. This book will bring back happy memories of those halcyon days and give the reader much fun in answering the questions. 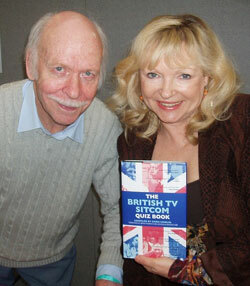 (Photo: Brian Murphy and his wife Linda Regan with a copy of 'The British TV Sitcom Quiz Book'). The perfect quiz for TV addicts! No one with a sense of humor should be without this book. It is the Bible for lovers of comedy. Chris Cowlin's book is a real treat for lovers of British TV sitcoms. Everything from "Only Fools and Horses" to "Fawlty Towers" - and even questions on something very close to my heart ... theme music! 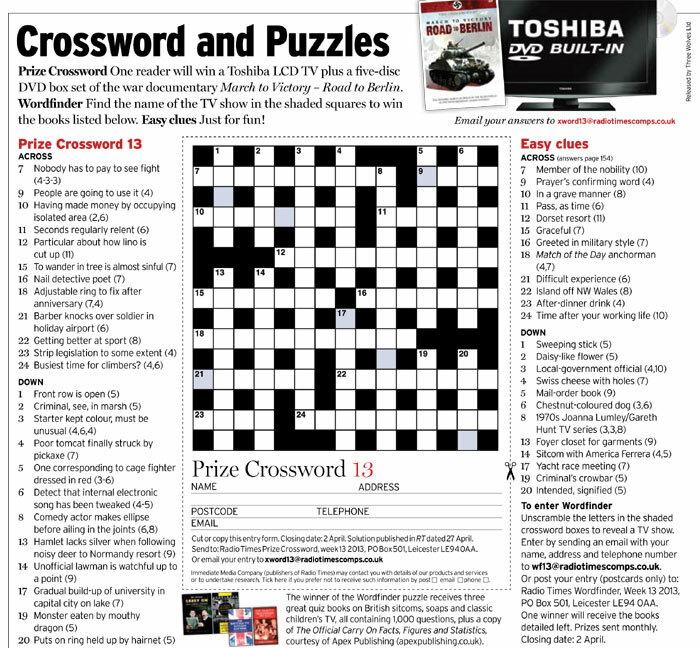 A must for all TV addicts and quiz lovers. Once again Chris Cowlin has come with a staggering selection of quiz questions which will doubtless keep sitcom addicts an TV watchers entertained. I won't give an answer away but just the recollection of the "Only Fools And Horses" character that always called Rodney Trotter "Dave" made me chuckle at the memory. After working in the business for 32 years I must have worked on nearly every comedy show going between 1966-1998. It was great to read all the many questions in Chris' book and remind myself of all the fun I used to have while working on the shows. This book is great fun for all comedy fans - enjoy! (Picture: Chris Cowlin with Harry Fielder, holding copies of 'The British TV Sitcom Quiz Book' and 'The Official Carry On Quiz Book'). A well researched book which is great fun for all the family, my family and I had great fun trying to answer the questions. A must for all telly-addicts, fun for all the family. We all love Sitcoms and now we have the perfect quiz book to see how much our love really measures up to our knowledge. Happy hours of Sitcom fun in the comfort of your own home. A must for anyone who thinks they know their TV! Chris has done some amazing research to get all this information together. This quiz book is amazing, a fun quiz book, I am sure it will bring many hours of fun and entertainment. A must for all TV Sitcom lovers! I always thought my youth was wasted on tv ... then this book came along, time for us TV geeks to shine. If you are a fan of British TV sitcoms this book really puts you to the test! Excellent! A great chance to see who's up to date with their British telly as well remembering favourites from years gone by. And as it a well known fact that anyone who doesn't like Fawlty Towers is evil, a chance to make sure your friends are good people. Hours of fun for all TV comedy lovers! What a good idea. The search for the answers will bring back memories of some of the best British comedies! Having spent years trying to drag myself away from the television when I should be doing other things, I now have another problem! I can't put Chris' quiz book down! Well done Chris, this is an excellent book for the family, I didn't realise how much I knew about sitcom and how much I had forgotten! After being involved in writing sitcoms for nearly fifty years, I was delighted to discover that Apex Publishing Ltd are publishing this book. I have been privileged to read an advance copy and all I can say is that it is a must for all those people who have watched and been entertained by the many situation comedy programmes over the past 50 years. Reading the questions and the answers is like taking a trip down memory lane. Forgotten situations and comedy performers from yesteryear came flooding back into one’s memory. The book is a superb nostalgic journey into that Golden Age when comedy reigned supreme. Questions about many of the successful situation comedies which I created and wrote, such as Harry Worth, George & the Dragon, Never Mind the Quality, Feel the Width, Bless This House, Nearest and Dearest, Love Thy Neighbour, Mind Your Language, are featured in the book and brought back lots of wonderful memories for me about the programmes and the actors with whom I worked. Don’t worry if you can’t answer all the questions. The memories they evoke will bring your hours of nostalgic pleasure. A book full of useful information, which will appeal to those lovers of comedy and provide a humorous challenge which will entertain you for hours. A useful addition to your library, and an ideal present for your friends. 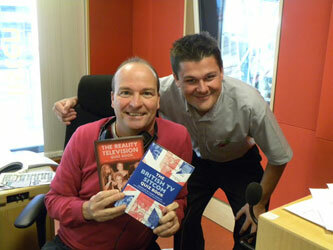 (Photo: Author Chris Cowlin and Vince Powell with a copy of 'The British Sitcom Quiz Book'). Everything you wanted to know about British TV Sitcoms. This book is ideal for writers, students and all lovers of this popular TV genre. 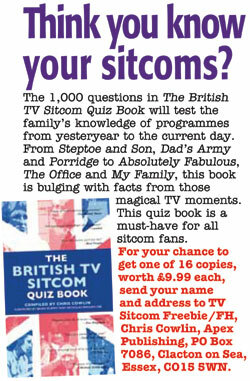 A very good and entertaining TV Quiz Book, it will keep the family on its' toes for hours. A user friendly reference book, opening the door to many happy hours down sitcom memory lane. As part of Thames TV’s sitcom team during the halcyon days of TV comedy and as a great admirer of our rivals contribution at the BBC, I found this little gem amazingly accurate and thus a must for all quiz lovers! Yippee, another one for my show-biz shelf. Keep them coming, Chris. This book will be on my coffee table to entertain my guests. Great memories of a very good time in my life! I cannot begin to imagine how many hours Chris Cowlin put into the research to producing the book. As a nation we seem to love any form of question and answer programme and I am sure Chris has filled a niche with this book. A must for future 'Mastermind' contenders, and the 'Eggheads'. Comedy to liven up the quiz! A very enjoyable book in which I learned that there were lots of interesting facts about sitcoms that I should have known – but now do. I shall have to buy the DVD’s to examine the subject matter, and enjoy the wealth of comedy talent that this book reveals. 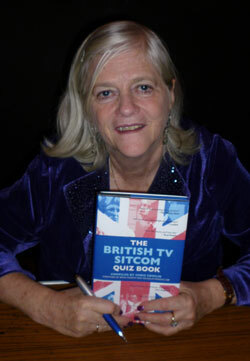 (Ann Widdecombe with a copy of 'The British TV Sitcom Quiz Book'). Firstly, I was well pleased with the book cover, eye catching detail, straight to the point. Secondly, it is an excellent source of endless enjoyment, perfect for a bit of “competitive fun”, to be enjoyed by several generations to come. Ideal as a Christmas filler or to while away a rainy day. I thoroughly recommend it! (Photo: Compiler Chris Cowlin with Joanna Lumley OBE). 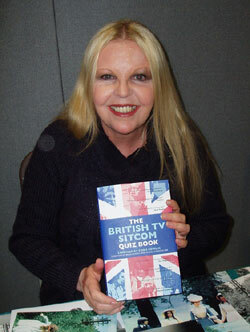 (Sally Thomsett with a copy of 'The British TV Sitcom Quiz Book). Full of things I’d forgotten and didn’t know. What a feast! Fascinating and fun in equal measures. What a remarkable piece of research, it will be great fun to have on the set of 'Benidorm' (between takes of course!) to keep us all amused. Congratulations Chris. I found this book fascinating. Unfortunately now that I am very old, my memory is not very good and I could not answer many questions! Except those about "On The Buses"! What a fab idea – what a journey to the great time of British Comedy – I am so proud to have been part of it in the 70’s. Well done Chris Cowlin for thinking of it and thank you! 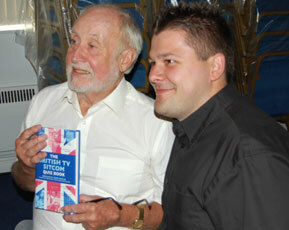 (Pictures: Chris Cowlin with Stuart Allen, holding a copy of 'The British TV Sitcom Quiz Book'. 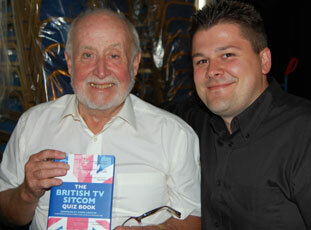 (Picture: Chris Cowlin with Ronald Wolfe, holding a copy of 'The British TV Sitcom Quiz Book'). Some of these are quite tough! This book is well laid out. This book will keep you entertained for hours! This book is great for anyone who likes quizzes and sitcoms. 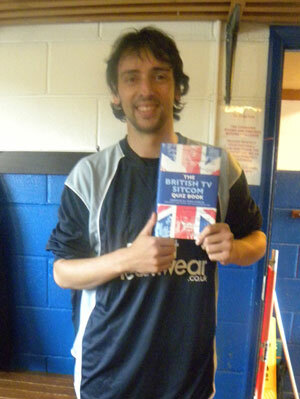 (Ralf Little with a copy of 'The British TV Sitcom Quiz Book'). I have spent a very happy time reading this entertaining book and going through the roll call of classic British sitcoms has made me very nostalgic. I was also especially pleased and honoured to see the section on ‘The Green Green Grass’. At last, I could answer all the questions correctly! This should be a great hit with old and young alike, a must have present for all dedicated fans! 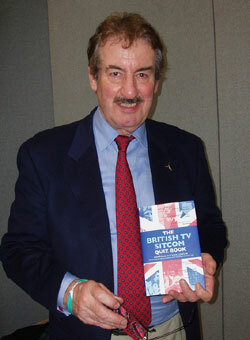 (Photo: John Challis with a copy of 'The British TV Sitcom Quiz Book'). Switch on your television set and you can guarantee that a vast array of both terrestrial and digital channels are showing one of our golden oldie sitcoms. Brits never tire of watching actors perform a routine they have probably enjoyed scores of times ... in fact, some of us can even quote verbatim from perennial favourites like Fawlty Towers and the Blackadder series! And now you can test your sitcom knowledge or invite friends to share a fun evening of questions and memories with an amazingly amusing new quiz book. There is every show you can recall here from 50s smash hit Hancock's Half Hour right through to the big hit of the new millennium, The Office ... and a staggering 1,000 questions that will have you racking your brains for the answers. As entertainer and actor Nicholas Parsons notes in his introduction to the book, the best British comedies have always been based on character rather than the American preference for an easily recognised type combined with slick dialogue. And with Britain's large and diverse cross-section of distinctive and unusual individuals, our skilled comedy writers have had rich material to work with. Take the classic series Dad's Army in which a group of very British characters were put in an unusual situation by talented writers and then skilled actors were give free rein to bring them to life. The result was a timeless comedy. Cowlin covers all aspects of sitcoms in this fascinating book – the series, the creators, the larger-than-life characters and the actors and actresses who found fame and fortune in their small screen roles. Who can forget David Jason's Del Boy, Dawn French as the anarchic Vicar of Dibley, the incomparable Ronnie Barker as the wicked and wily Fletcher in Porridge and Richard Wilson as the unforgettable Victor Meldrew? And for younger readers there are plenty of questions relating to more up-to-date series like Two Pints of Lager and A Packet of Crisps, Not Going Out and Extras. This book is as much a treasure trove of facts and figures as it is a quiz book so if you just want to relive some classic comedy memories and enjoy a good laugh, you'd be mad to miss this golden nugget of TV nostalgia. CAN YOU MATCH KING OF TV SITCOM TRIVIA? CHRIS Cowlin is only 28, yet his tastes in comedy stretch back to an era before he was a twinkle in his mum and dad's eyes. “Only the other night I was watching Steptoe and Son, and you think 'Even 40 years later, you know the jokes coming and you're laughing already. They're still funny,” he says. “I was brought up with that. My mum and dad had videos and watched it a lot, as well as On The Buses, Open all Hours, Bless this House. George and Mildred, even.” He was also raised on Bread, which started in 1986, when he was about six. On average, Chris has written more than one book for each year of his life thus far - most of them quiz compilations about football clubs from Southend to Sunderland and Colchester to Chesterfield. About 18 months ago came The Official Carry On Quiz Book co-compiled with Paul Burton, the innuendo-laden films being another of his passions. But he admits his latest offering, The British TV Sitcom Quiz Book, is the favourite among his 30-plus volumes so far. “I absolutely love sitcoms! Who doesn't?” he laughs. “To be honest, Steve, I could have done 5,000 questions. To stop at 1,000 was quite hard. Chris reckons one of the hallmarks of a successful sitcom is its use of the family setting, because viewers can instantly identify with it. “My Family, which has just gone past 100 episodes, is really Bless This House 30 years on. The kids don't understand the parents, the parents don't understand the kids, and there's no better format, really, because virtually everyone can relate to it and know what people are feeling. Looking at his childhood, you can see how Chris has come to be compiling questions to intrigue, challenge and frustrate. He hailed from Walthamstow and moved to the Clacton-on-Sea area when he was about 10, going to Clacton County High. “Anyone who knew me knew I loved football. I used to go every weekend. I was a Spurs fan. I'd been brought up in a family of Arsenal supporters and I wanted to be different! I liked the way they played - Gazza (Paul Gascoigne) and Gary Lineker were there at the time and they were people's favourite players. Then he spent more than two years with a book-publishing company in Colchester. People saw him turning his hand to most tasks, he says, and suggested he ought to start up on his own. “At first you think 'No! Definitely not! '” But it came to pass and seven years ago Clacton-based Apex Publishing was born. It specialises in autobiographies, sport and true crime. Among the books published last year were autobiographies by Vince Powell, the writer of Bless This House and Love Thy Neighbour; Lea Walker (Big Brother 7); Maria Lawson (X Factor), and Mick Abrahams, a founder member of blues rock/folk rock band Jethro Tull. There are three staff and himself, though Apex can call on an army of freelance specialists: editors, graphic designs, indexers and so on. In reading about the company, you'll see Chris described as production manager here, publishing manager there. “When you put 'managing director', it just looks too . . . formal . . . and I don't like that,” he laughs. “Sometimes it will be me that picks the phone up. In most companies, you'd never get that.” He relishes being hands-on and maintaining good relationships with the people he deals with both inside and outside the firm, not going all corporate and being one of those MDs who hides behind closed doors. And he's not content with simply plodding on from day to day, either. The company steers clear of what's known as vanity publishing, where authors bankroll all or a proportion of the costs of printing their work, though Chris says some early Apex titles were funded along those lines. money charging hopefuls £2,000 a pop to publish their treasured words, he admits, but nowadays it's about books that have a commercial life - not author-funded tomes that gather dust in a pile in their garage. 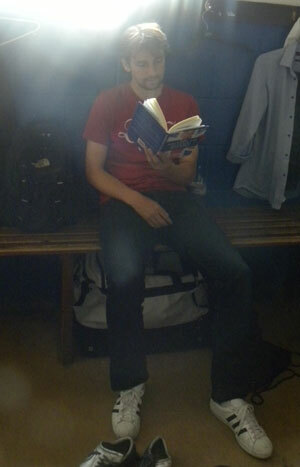 Chris's own titles came about after Apex published a number of football books, such as The Official Ipswich Town Quiz Book. The chance arose to get involved himself, and the first to bear his name - The West Ham United Quiz Book - rolled off the presses early in 2006. Does anyone ever pull him up and insist “You've got that wrong!”? Volumes covering Rotherham, Yeovil, Birmingham City, Scotland's Heart of Midlothian and Greenock Morton, West Brom, Sunderland, Coventry, Carlisle and Chesterfield (mainly co-compilations) are due out before mid-November. And at Hallowe'en, appropriately enough, The Horror Film Quiz Book (co-written with Mark Goddard) will be added to the canon. These books written himself are really the icing on the cake. Chris works on his own titles outside the requirements of the day-job, conscious of the need to maintain a balance between Apex matters, his own projects and family life with wife Julia and son Harry, who's two. Not that it's always easy switching off. . .
* CHRIS Cowlin's favourite current sitcom is Gavin & Stacey, though he came to it late on. “I must admit, I got into it with series two - funnily enough, in the same way as The Office. I watched a few episodes of that and didn't really like it. Someone said to me 'Chris, with The Office, you need to watch it from the first episode, to get it.' I thought 'No . . . It's like food: take a bite of something and don't like it, and you don't do it again.' But I took his advice and saw the first episode. It wasn't until I'd watched two or three that I really got into it and started seeing the jokes. “Gavin & Stacey was very similar. It gets funnier and funnier. You know when you love a sitcom, because you can watch it again and again and again, and when you watch it a second or third time there are always little bits you didn't notice the first time that you pick up: things in the background, who's doing what, who's saying what. My Family he nominates as one of the few contemporary shows parents need have no qualms about, with its clean, family-based good humour. 1. Only Fools and Horses: In which part of London did the Trotters live? 2. Keeping Up Appearances: Who wrote this sitcom, as well as Last of the Summer Wine and Open All Hours? 3. The Office: What was the name of Dawn Tinsley's boyfriend - Gareth, Keith or Lee? 4. George and Mildred: Name the sitcom that featured George and Mildred before this sitcom was made. 5. Fawlty Towers: How many episodes were made - 12, 22 or 32? * Answers: 1. Peckham. 2. Roy Clarke. 3. Lee. 4. Man About the House. 5. 12. Great fun for all lovers of the great British sitcom. The British TV Sitcom Quiz Book is a comprehensive guide to everything you ever wanted to know about one of the UK's greatest comedy institutions; the sit-com. Pure, undiluted nostalgia combined with thousands of fascinating facts. Don't miss this one! All you ever need to know about your favourite sitcoms ­and more. Loads of fun for TV junkies. The book provides an opportunity to see just how well you know those classic characters who feel like part of the family - and is sure to raise a smile as you remember those timeless episodes. The ultimate challenge for sitcom fans, this book is a must for telly addicts. 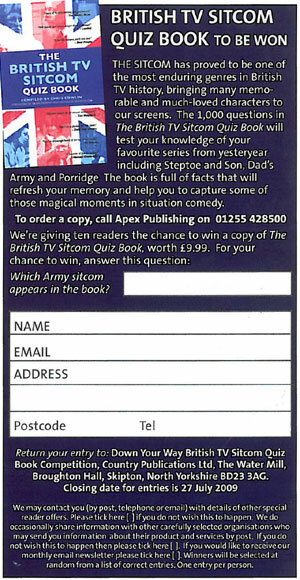 Anyone who thinks they know their TV sitcoms will be in for a shock when they see the questions in this quiz book. Hours of head-scratching fun guaranteed as you recall classic comedy moments while searching for the right answers. Remember the golden oldies of British TV sitcoms? See how well you and your family and friends can score, striving for silver and going for gold with this entertaining book. 1,000 great questions, fun for all the family, a must for any TV sitcom fan! Sitcom fans, put this one in your basket - it's the most fun you can have with the telly off. This well researched book is certainly up to the job of testing British sitcom knowledge. It sets itself apart from other quizzes by refreshingly avoiding being patronising or insultingly easy. It certainly got us wracking our brains! From golden oldies like On the Buses to modern-day cult shows such as The Office, and from national insitutions like Fools and Horses to hidden gems like Watching, they're all in the highly entertaining book which is required reading for all TV addicts. Meticulously researched and endlessly entertaining. 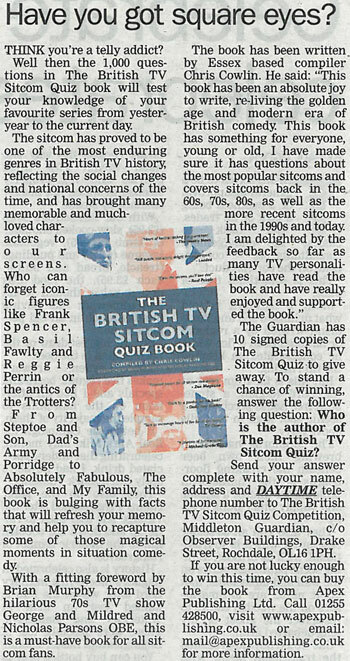 The British TV Sitcom Quiz Book will be a hit with TV anoraks everywhere. End all TV 'who did...? arguments here! And great fun to get the party and the pub quiz going. A fantastic combination of questions on TV sitcoms, a must buy! A quiz that will puzzle and utterly delight the square-eyed. If you love British sitcoms good or bad and think you know everything there is to know about them, you won't be able to put this book down! This book is a must for all sitcom addicts young and old as it covers sitcoms since the advent of television. It is also an incredibly useful book for pub quizzes and could be good fun for the family on a rainy Sunday afternoon. Great fun and a real brain teaser for all TV sitcom junkies! A quiz book that is filled with loads of questions of varying difficulty that will get you, your family and friends thinking. Great fun for those of us who have enjoyed watching classic TV sitcoms on the box. After working in the business for 32 years I must have worked on nearly every comedy show going between 1966-1998. It was great to read all the many questions in Chris' book and remind myself of all the fun I used to have while working on the shows. This book is great fun for all comedy fans - enjoy! THE SITCOM is one of the most enduring genres in British TV history, reflecting the social changes and national concerns of the time, and has brought many memorable and much-loved characters to our screens. Who can forget the likes of Frank Spencer, Basil Fawlty and Reggie Perrin or the antics of the Trotters, the Meldrews and the staff of Grace Brothers’ department store, to name but a few? Now you can buy an entertaining new book, The British TV Sitcom Quiz Book, packed with 1000 questions which will test your knowledge of your favourite series. From Steptoe and Son, Dad’s Army and Porridge to Absolutely Fabulous, The Office and My Family, this book is bulging with facts that will refresh your memory and help you to recapture some of those magical moments. 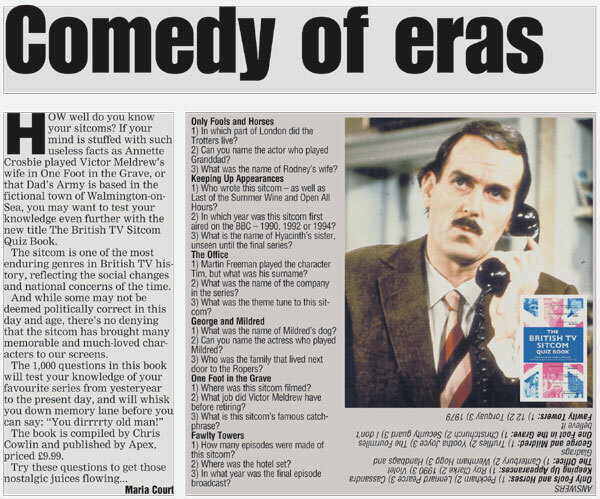 With a fitting foreword by Brian Murphy from the hilarious 1970s TV show George and Mildred and Nicholas Parsons OBE, this is a must-have book for all sitcom fans — and here are five questions to give you a taste on what’s on offer. 1. Which actor played Albert Steptoe? 2. What is the name of Reginald Perrin’s son? 3. In The Likely Lads, what was the name of the factory where Bob and Terry worked? 4. How many series were made of Father Ted? 5. Which job did Victor Meldrew do before retiring? Answers: 1. Wilfrid Brambell. 2. Mark. 3. Ellison’s Electrical. 4. Three. 5. Security guard. We’ve 20 copies to give away. To win one, just answer the following question. Then send your answer on the back of a postcard or sealed down envelope to Sitcom Quiz Book, The Sunday Post, 2 Albert Sq, Dundee, DD1 9QJ. First 20 correct entries out of the hat will win a copy of the book. 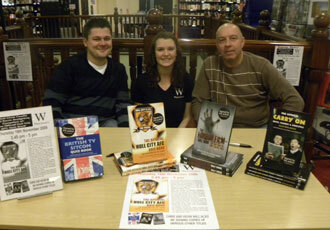 * You can buy the book in most good bookshops or by calling Apex Publishing Ltd on 01255 428500. This book is as funny, entertaining and addictive as the best British sitcoms! book. Don't be a plonker get this book! This is a great quiz book for viewers like myself who span the years from the 1960s. A real test of memory as well as knowledge on fondly rembered shows long gone as well as modern gems. Thought you knew everything about British comedy? Think again! 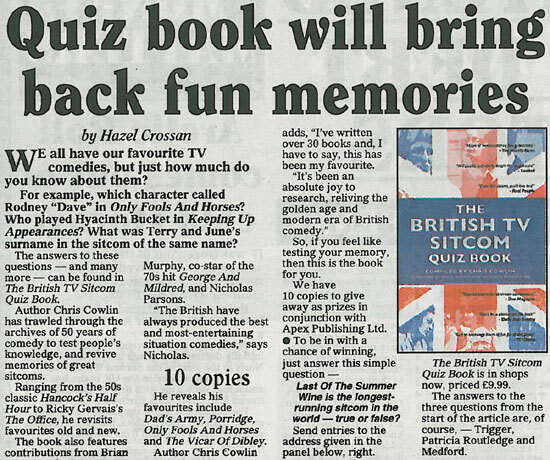 The British TV Sitcom Quiz Book will test your knowledge and leave you laughing out loud! A great book for any TV fan! If you love all things TV, you’ll love this! 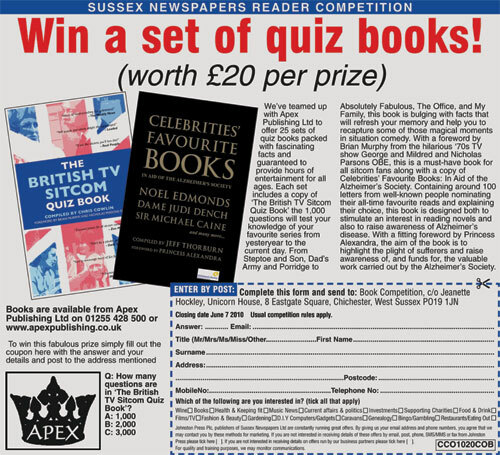 Apex Publishing is offering Lynn News readers the chance to win one of three signed copies of The British TV Sitcom Quiz Book, compiled by Chris Cowlin. The sitcom has proved to be one of the most enduring genres in British TV history, reflecting the social changes and national concerns of the time, and has brought many memorable and much-loved characters to our screens. Who can forget iconic figures such as Frank Spencer, Basil Fawlty and Reggie Perrin or the antics of the Trotters, the Meldrews and the staff of Grace Brothers’ department store, to name but a few? The 1,000 questions in The British TV Sitcom Quiz Book will test your knowledge of your favourite series from yesteryear to the current day. From Steptoe and Son, Dad’s Army and Porridge to Absolutely Fabulous, The Office, and My Family, this book is bulging with facts which will refresh your memory and help you recapture some of those magical moments in situation comedy. With a fitting foreword by Brian Murphy from the hilarious ’70s TV show George and Mildred and Nicholas Parsons, this is a must-have book for all sitcom fans. If you are not lucky enough to be a winner, books are available from Apex Publishing Ltd on 01255 428 500. * In which hilarious ’70s TV show did Brian Murphy appear? Was it a) George and Mildred, b) Terry and June, or c) Tom and Jerry? 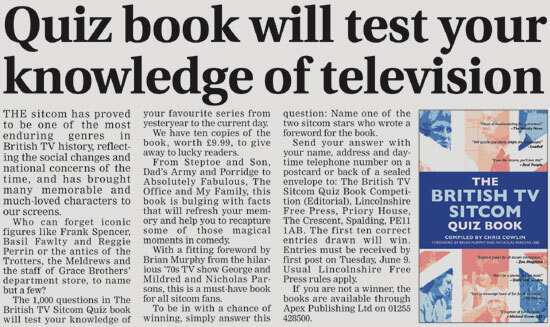 Send your answer, together with your name, address and daytime telephone number on a postcard or the back of a sealed envelope to: TV Sitcom Quiz Book Competition, Newsdesk, Lynn News, Limes House, Purfleet Street, King’s Lynn, Norfolk, PE30 1HL, to arrive by Thursday, June 25. COMPILED BY CHRIS COWLIN, PUBLISHING BY APEX PUBLISHING, PRICED £9.99. time, bringing many memorable and much-loved characters to our screens. the Trotters, the Meldrews and the staff of Grace Brothers’ department store? Absolutely Fabulous, The Office and My Family. of those know-alls in the family. With two forewords, one by Brian Murphy — best known for his role as George Roper in the sitcoms Man About The House and George and Mildred — and a second by Nicholas Parsons, this is a must-have book for all sitcom fans. A good range of questions for both novices and experts. Good family fun. If you like sitcoms, you'll love this! It is at times like these that we need someone to come along and blow away some depression induced dark clouds. And here he is with a compilation of around 1,000 questions to test your knowledge of some of TV’s best loved sitcoms. Chris Cowlin’s book will not solve the current financial fiasco nor drive away worries about unemployment and mortgages; but it will make you laugh. It will make you laugh because it recalls some of the great sitcoms that have graced our TV screens over the years. From Steptoe and Son through to Dad’s Army and Porridge and on to Absolutely Fabulous, The Office and My Family there is something to tease and intrigue everybody. And there you have it; a combination of happy memories and fun. Could anything be better or more appropriate? Chris Cowlin is to be applauded for his sterling work in compiling this book. It should be available on the NHS as an antidepressant. Wow! It's just the kind of thing I'd like on my coffee table! This book is sure to encourage hours of fun for all the family. A comprehensive collection of questions from some of the UK's best comedy shows from years gone by, to modern day. Tough questions that got me thinking about all those great programmes. This will certainley test peoples knowledge of the TV Sitcom. Essential posers for all sit-com connoisseurs. THERE’S only one thing that comes close to watching telly, and that’s testing your knowledge of it. A new book entitled The British TV Sitcom Quiz Book, compiled by Chris Cowlin with forewords from comedy giants Brian Murphy and Nicholas Parsons OBE, arrived on my desk just in time for a three hour car journey to the South West. We had to give some of the categories on the likes of ‘modern’ comedies like Coupling and Not Going Out a miss but had plenty of fun trawling through the memory bank and tackling teasers on my faves including Open All Hours, Porridge and Phoenix Nights. I think I got two out of ten on Mind the Language but the show was so bad I’d probably blanked most of it out completely! As well as questions on individual shows, there are ‘guess the number of episodes’ posers and anagrams to untangle. Writers and directors get a look in and I particularly liked the section on filming locations. department store, to name but a few? your favourite series from yesteryear to the current day. We have ten copies of the book, worth £9.99, to give away to lucky readers. From Steptoe and Son, Dad’s Army and Porridge to Absolutely Fabulous, The Office and My Family, this book is bulging with facts that will refresh your memory and help you to recapture some of those magical moments in comedy. Mildred and Nicholas Parsons, this is a must-have book for all sitcom fans. two sitcom stars who wrote a foreword for the book. 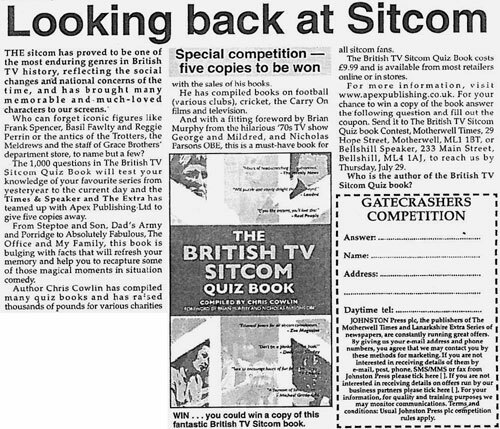 postcard or back of a sealed envelope to: The British TV Sitcom Quiz Book Competition (Editorial), Lincolnshire Free Press, Priory House, The Crescent, Spalding, PE11 1AB. The first ten correct entries drawn will win. Entries must be received by first post on Tuesday, June 9. Usual Lincolnshire Free Press rules apply. 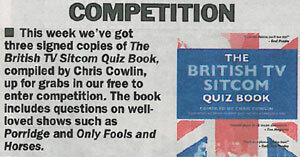 WE have five prize copies of The British TV Sitcom Quiz Book, compiled by Chris Cowlin. The sitcom has brought many memorable, much-loved characters to our screens. Who can forget iconic figures such as Frank Spencer, Basil Fawlty and Reggie Perrin, or the antics of the Trotters, the Meldrews and the staff of Grace Brothers' department store. The sitcom is also one of the most enduring genres in British TV history, reflecting social changes and national concerns. The 1,000 question in this new book will test your knowledge of your favourite series, from yesteryear to the current day. From Steptoe and Son, Dad's Army and Porridge to Absolutely Fabulous, The Office and My Family, this book is bulging with facts, which will refresh your memory and help recapture some of those magical moments in situation comedy. 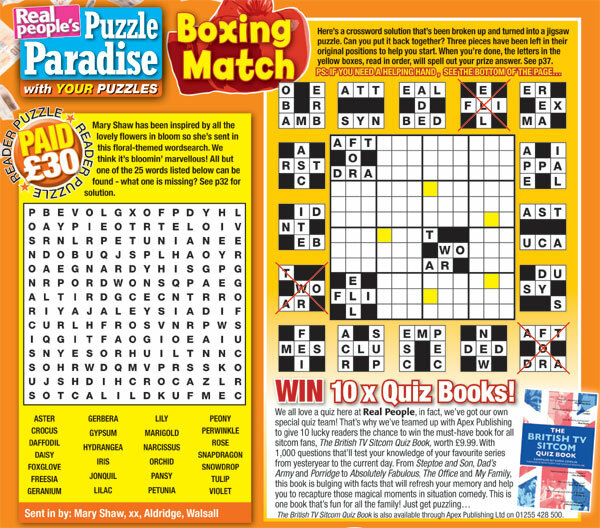 For you chance to win just answer the question in this week's paper and send it to us in the coupon provided. 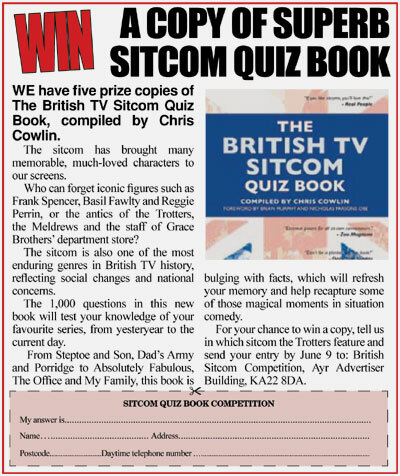 THE British TV Sitcom Quiz Book was published last month and we've got three copies up for grabs in a free to enter competition. Former George and Mildred and current Last of the Summer Wine actor Brian Murphy has written the foreword, along with TV personality Nicholas Parsons OBE. Murphy said: “I was fortunate enough to have appeared in what is now often regarded as the Golden Age of television sitcoms during the 70s and 80s. The book contains 1,000 questions and will test your knowledge of your favourite series from yesteryear to the current day. From Steptoe and Son, Dad’s Army and Porridge to Absolutely Fabulous, The Office, and My Family, it is bulging with facts that will refresh your memory and help you to recapture some of those magical moments in situation comedy. The book retails for £9.99. For more details, visit http://www.apexpublishing.co.uk All you have to do to be in with a chance of winning is answer this question: Name the two lead actors in The Likely Lads who played Terry Collier and Bob Ferris. 14 May 2009 - Chris Cowlin was interviewed on BBC Radio Essex 103.5 & 95.3 FM. 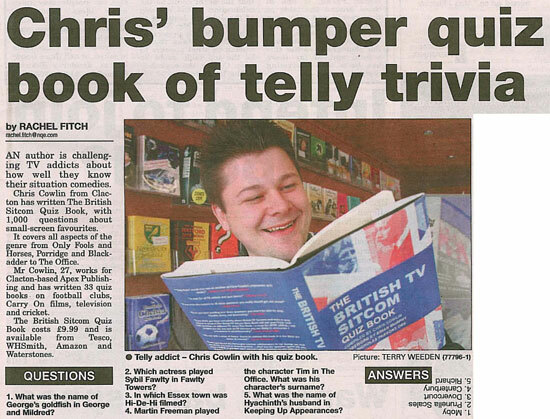 Chris answered questions about his book 'The British TV Sitcom Quiz Book'. He was interviewed on 'The Steve Scruton Show'. 16 May 2009 - Chris Cowlin was interviewed on West Sound 1035 AM. Chris answered questions about his book 'The British TV Sitcom Quiz Book'. He was interviewed on 'The Ian Young Show'. 18 May 2009 - Chris Cowlin was interviewed on Touch Radio 101.6 FM. Chris answered questions about his book 'The British TV Sitcom Quiz Book'. He was interviewed on 'The Dave James Show'. 18 May 2009 - Chris Cowlin was interviewed on Halton Community Radio 92.3 FM. 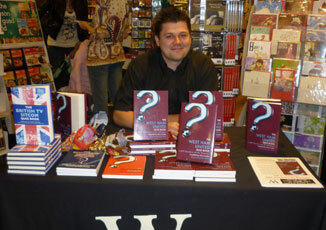 Chris answered questions about his book 'The British TV Sitcom Quiz Book'. He was interviewed on 'The Cath Bore Show'. 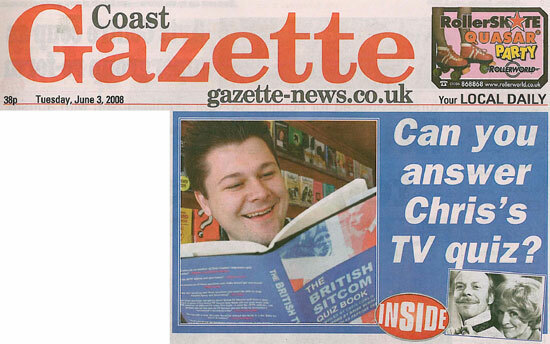 19 May 2009 - Afan 97.4 FM featured 'The British TV Sitcom Quiz Book' on 'The Sam Vaughan Show', they read questions from the book to test their listeners. 19 May 2009 - Chris Cowlin was interviewed on Magic 999 AM. 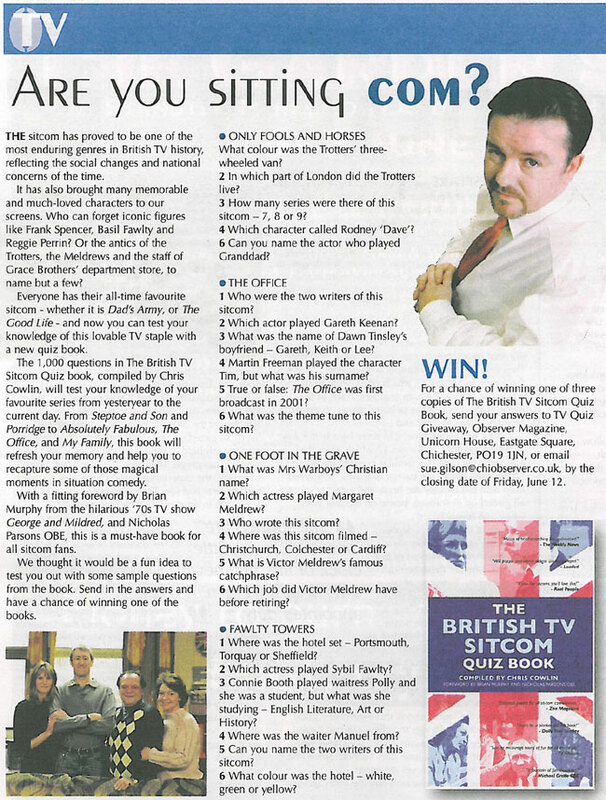 Chris answered questions about his book 'The British TV Sitcom Quiz Book'. He was interviewed on 'The Rob Charles Show'. 19 May 2009 - Chris Cowlin was interviewed on Newstalk 106-108 FM. Chris answered questions about his book 'The British TV Sitcom Quiz Book'. He was interviewed on 'The Tom Dunne Show'. 19 May 2009 - Chris Cowlin was interviewed on BBC Radio Humberside 95.9 FM. Chris answered questions about his book 'The British TV Sitcom Quiz Book'. He was interviewed on 'The Peter Levy Show'. 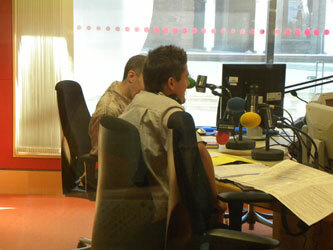 19 May 2009 - Chris Cowlin was interviewed on BBC Radio WM 95.6 FM. 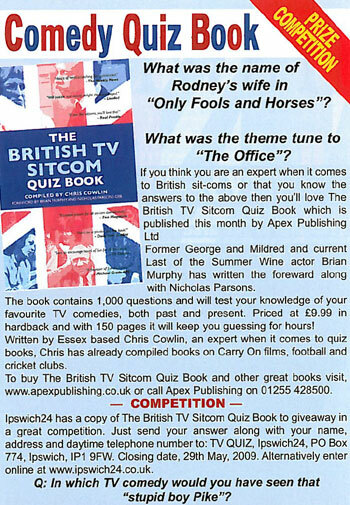 Chris answered questions about his book 'The British TV Sitcom Quiz Book'. He was interviewed on 'The Paul Franks Show'. 19 May 2009 - Chris Cowlin was interviewed on BBC Radio Berkshire 104.1 FM. Chris answered questions about his book 'The British TV Sitcom Quiz Book'. He was interviewed on 'The Phil Kennedy Show'. 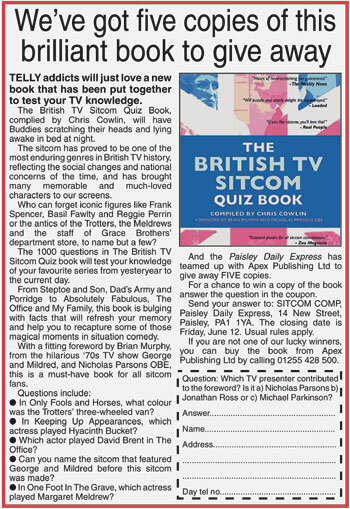 19 May 2009 - Magic 990 AM featured 'The British TV Sitcom Quiz Book' on 'The Trevor Thomas Show', they read questions from the book to test their listeners. 21 May 2009 - Chris Cowlin was interviewed on BBC Radio Jersey 88.8 FM. Chris answered questions about his book 'The British TV Sitcom Quiz Book'. He was interviewed on 'The Carrie Cooper Show'. 21 May 2009 - Chris Cowlin was interviewed on Wythenshawe 97.2 FM. Chris answered questions about his book 'The British TV Sitcom Quiz Book'. He was interviewed on 'The Mike George Show'. 22 May 2009 - Chris Cowlin was interviewed on Signal 2 1170 AM. 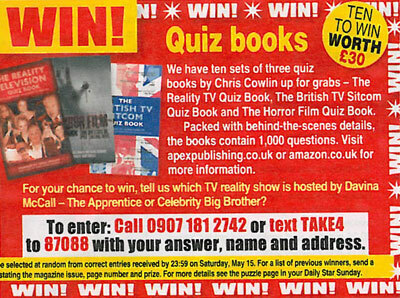 Chris answered questions about his book 'The British TV Sitcom Quiz Book'. He was interviewed on 'The Paul Fairclough Show'. 22 May 2009 - Chris Cowlin was interviewed on Salford City Radio 94.4 FM. 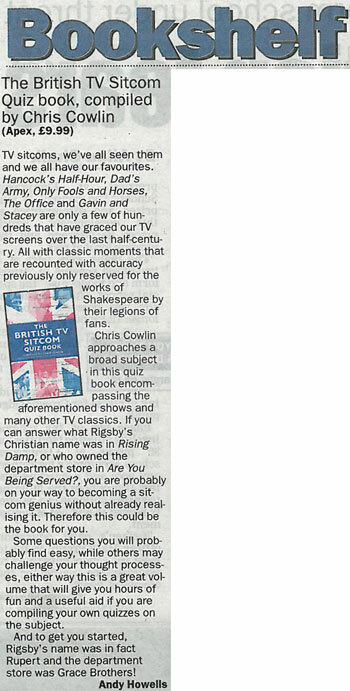 Chris answered questions about his book 'The British TV Sitcom Quiz Book'. He was interviewed on 'The Chris Brophy Show'. 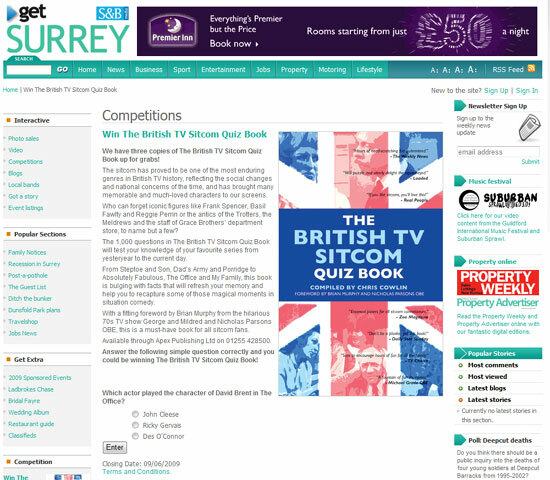 22 May 2009 - Eagle Radio 96.4 FM run a competition with a signed copy of 'The British TV Sitcom Quiz Book'. 23 May 2009 - Chris Cowlin was interviewed on BBC Radio Coventry & Warwickshire 94.8 FM. 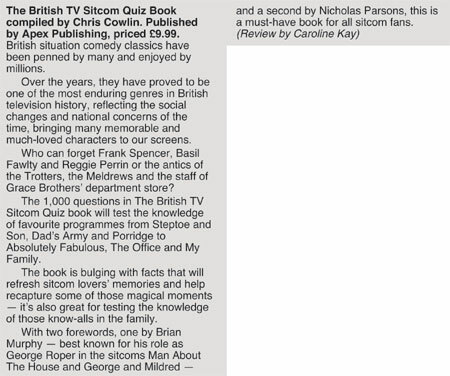 Chris answered questions about his book 'The British TV Sitcom Quiz Book'. He was interviewed on 'The Malcolm Boyden Show'. 23 May 2009 - Chris Cowlin was interviewed on BBC Radio Scotland 92.4 FM. 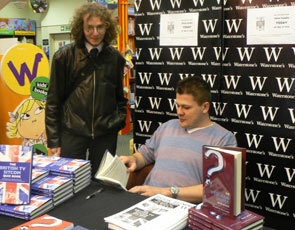 Chris answered questions about his book 'The British TV Sitcom Quiz Book'. He was interviewed on 'The Janice Forysth Show'. 23 May 2009 - Chris Cowlin was interviewed on Bristol Community Radio 93.2 FM. Chris answered questions about his book 'The British TV Sitcom Quiz Book'. He was interviewed on 'The Mark Le-Leivre Show'. 24 May 2009 - Chris Cowlin was interviewed on BCB Radio 106.6 FM. Chris answered questions about his book 'The British TV Sitcom Quiz Book'. He was interviewed on 'The Carl Gresham Show'. 24 May 2009 - Chris Cowlin was interviewed on Radio Borders 96.8 FM. Chris answered questions about his book 'The British TV Sitcom Quiz Book'. He was interviewed on 'The Hugh Brown Show'. 24 May 2009 - Chris Cowlin was interviewed on Focal Radio. 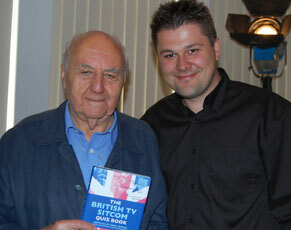 Chris answered questions about his book 'The British TV Sitcom Quiz Book'. He was interviewed on 'The Jay Davis Show'. 25 May 2009 - Chris Cowlin was interviewed on BBC Radio Bristol 94.9 FM. 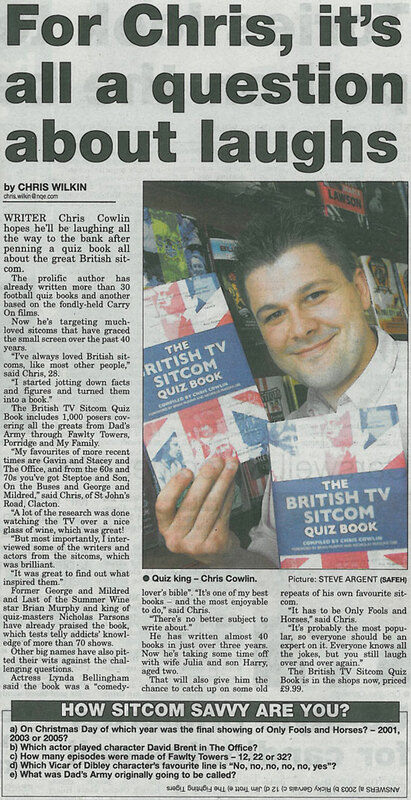 Chris answered questions about his book 'The British TV Sitcom Quiz Book'. He was interviewed on 'The Jason Harrold Show'. 26 May 2009 - Chris Cowlin was interviewed on Castledown Radio 104.7 FM. 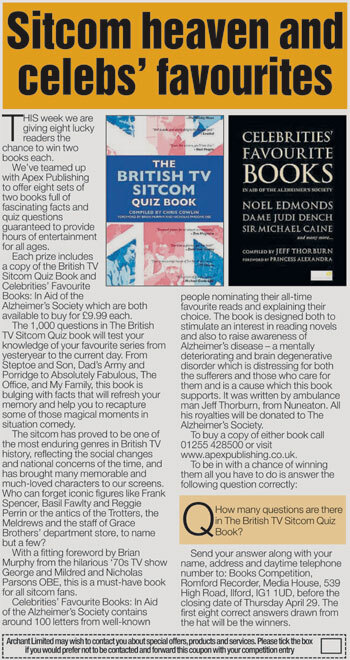 Chris answered questions about his book 'The British TV Sitcom Quiz Book'. He was interviewed on 'The Baz Reilly Show'. 26 May 2009 - Chris Cowlin was interviewed on Leith 98.8 FM. 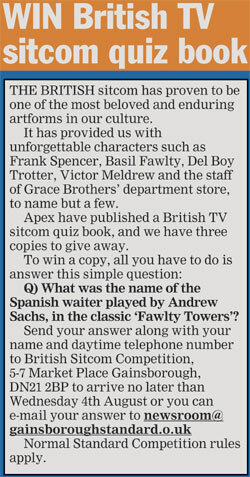 Chris answered questions about his book 'The British TV Sitcom Quiz Book'. He was interviewed on 'The Graeme Logan Show'. 26 May 2009 - Chris Cowlin was interviewed on Smooth Radio Scotland 105.2 FM. 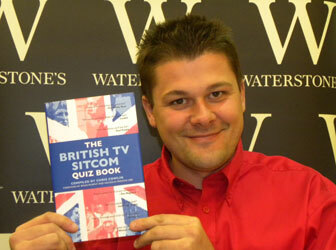 Chris answered questions about his book 'The British TV Sitcom Quiz Book'. He was interviewed on 'The Dougie Jackson Show'. 29 May 2009 - Chris Cowlin was interviewed on BBC Radio Kent 96.7 FM. Chris answered questions about his book 'The British TV Sitcom Quiz Book'. He was interviewed on 'The Pat Marsh Show'. 29 May 2009 - Chris Cowlin was interviewed on BBC Radio Leeds 102.7 FM. Chris answered questions about his book 'The British TV Sitcom Quiz Book'. He was interviewed on 'The Paul Carrington Show'. 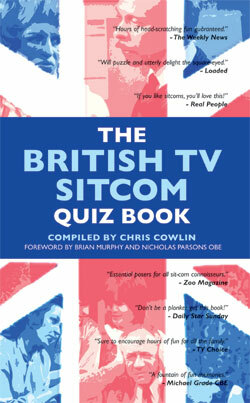 30 May 2009 - BBC Radio 2 feature and run a competition on 'The British TV Sitcom Quiz Book' compiled by Chris Cowlin. The competition was run on 'The Jonathan Ross Show'. 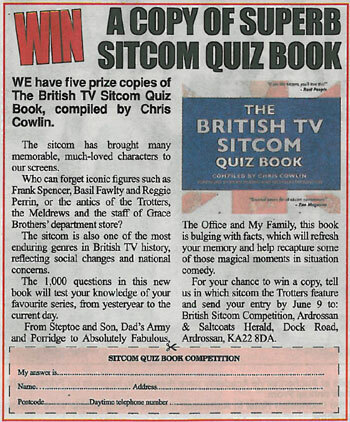 30 May 2009 - KCFM 99.8 FM feature and run a competition on 'The British TV Sitcom Quiz Book' compiled by Chris Cowlin. The competition was run on 'The James Clark Show'. 8 June 2009 - Chris Cowlin was interviewed on BBC Radio Surrey 104 FM. Chris answered questions about his book 'The British TV Sitcom Quiz Book'. He was interviewed on 'The Mark Carter Show'. 13 June 2009 - Chris Cowlin was interviewed on BBC Radio Kent 96.7 FM. Chris answered questions about his book 'The British TV Sitcom Quiz Book'. He was interviewed on 'The Paul James and Paul Harris Show'. 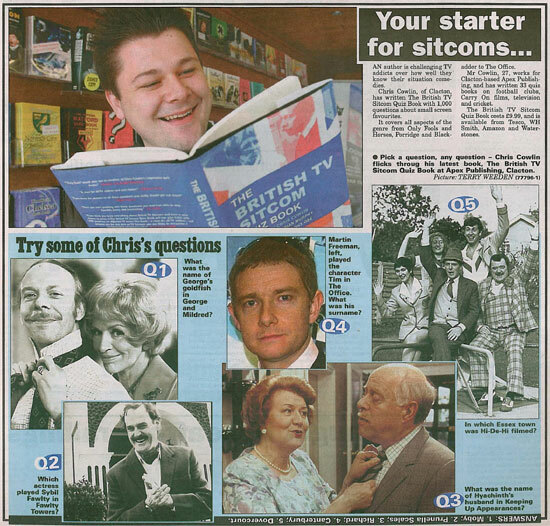 19 June 2009 - BBC Radio Norfolk 95.1 FM feature 'The British TV Sitcom Quiz Book' compiled by Chris Cowlin. 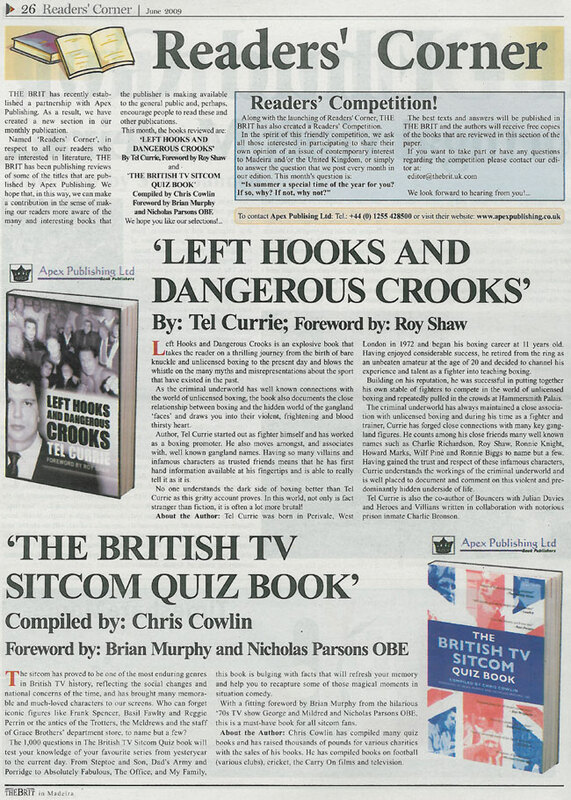 The book was featured on 'The Roy Waller Show'. Roy Waller read out a number of questions, testing his listeners and Louis Barfe (writer, broadcaster and musician). 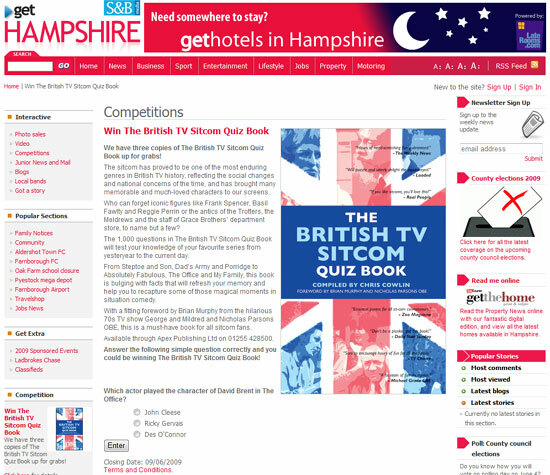 29 July 2009 - Colchester Garrison 107 FM featured and run a competition on 'The Soap Quiz Book' compiled by Mark Bennison and 'The British TV Sitcom Quiz Book' compiled by Chris Cowlin. 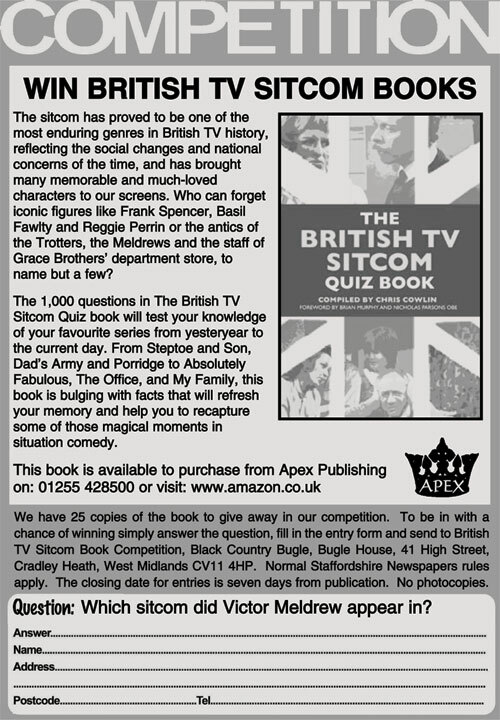 12 November 2009 - Source Radio featured 'The British TV Sitcom Quiz Book' and 'The Official Coventry City Quiz Book' compiled by Chris Cowlin. 26 June 2009 - Chris Cowlin was interviewed on Penwith Radio. Chris answered questions about his book 'The British TV Sitcom Quiz Book'. He was interviewed on 'The Dave Pascoe Show'. 21 November 2009 - Chris Cowlin was interviewed on BBC Radio Stoke & Staffordshire 94.6 FM. Chris answered questions about his book 'The British TV Sitcom Quiz Book', he also talked about various football quiz books he has compiled. The show was also broadcast on BBC Radio Shropshire 96 FM and BBC Radio Hereford & Worcester 104 FM. 15 September 2010 - Chris Cowlin was interviewed on Leith 98.8 FM. Chris answered questions about his book 'The British TV Sitcom Quiz Book'. He was interviewed on 'The Graeme Logan Show'. 12 October 2010 - Chris Cowlin was interviewed on Express FM. 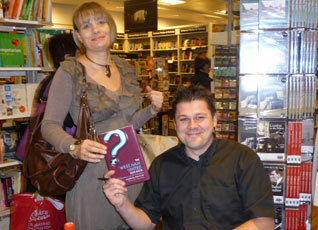 Chris answered questions about his book 'The British TV Sitcom Quiz Book'. 13 November 2010 - Chris Cowlin was interviewed on BBC Radio Coventry & Warwickshire 94.8 FM. Chris answered questions about his books 'The Official Coventry City Quiz Book', 'The Reality Television Quiz Book' and 'The British TV Sitcom Quiz Book'. Frustratingly good questions in this book, I just wish I could remember the answers! I like to think of myself as a sitcom expert but this book can show how much you really do know. A fantastic and thoroughly comprehensive quiz book to see if you know your Black Boots from Blackadder! 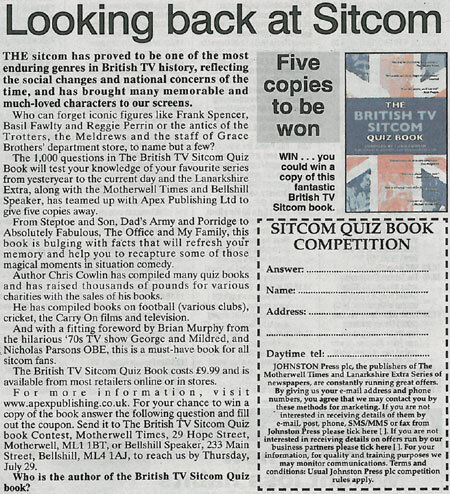 Ashbourne Radio 96.7 FM featured 'The British TV Sitcom Quiz Book' on various shows over a 6 month period, they read questions from the book to test their listeners. I love the book. It brought back so many happy memories spent watching the telly with my mum and dad. Oak 107 & 107.9 FM featured 'The British TV Sitcom Quiz Book' on 'The Mark Rowley Show', they read questions from the book to test their listeners. Energy FM featured 'The British TV Sitcom Quiz Book' on 'The Matt Fletcher Show', they read questions from the book to test their listeners. A great idea for a book! Essential resource for quizmasters everywhere. Great fun! If you love TV, you'll love this book! As a sitcom anorak I thought I knew it all but Chris Cowlin has tested me in ways I never thought possible. A fabulous book and one to get the grey matter going. This will also bring back lots of happy viewing memories. “Only Fools” would miss out on another of Chris Cowlin’s impressive quiz books. This is a great book and a very useful resource which had me racking my brains for the answers! I never knew how much time I had spent watching sitcoms throughout my life … from my teenage years until today and Chris Cowlin’s book has made me realise that it wasn’t time wasted as I can answer far too many of the questions correctly. Its terrific fun … and it may be a cliché … but they don’t make them like they used to! This book is right up my street. It is great to pick up and test my British Sitcom knowledge and it makes me realise just how much I don't know! Castledown Radio runs a weekly radio quiz called 'Radioheads' and this book is ideal swatting up material. A challenging, entertaining and potentially-addictive quiz for anyone who thinks they know their sitcoms inside out. It brought back a lot of good memories of good old British television shows I used to watch when I was younger! A fascinating read and rather fun at a dinner party! Brilliant! Something for everyone with a soft spot for the best of British sitcoms! Once you start it's almost impossible to put down! A heartfelt delve into our British Comedy heritage. This book makes you proud to be British. Great stuff! ... it makes you realise how great British TV sitcoms are and how little you actually know! A true test for anyone who considers themselves a classic British TV trivia buff! You'll be driving yourself nuts trying to remember some of the answers. A must for quiz setters or TV fanatics alike. A brilliant memory of TV at it's best! 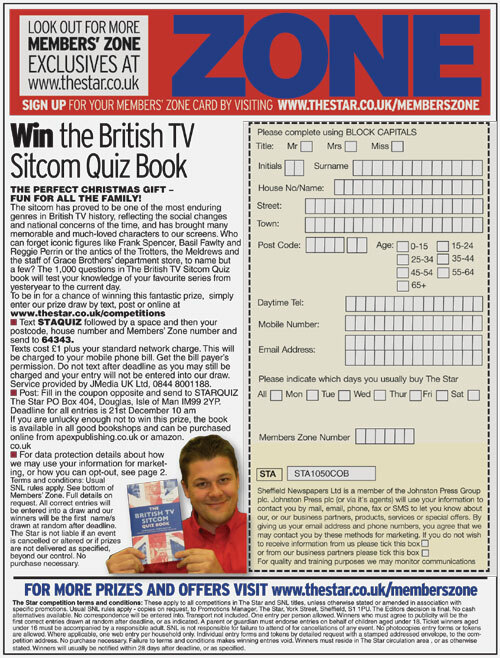 A great quiz with hours of fun for all the family, filled with happy memories of some our best-loved TV comedy shows. This is the essential companion for anyone who considers George and Mildred the Golden Age of the Sitcom - so many memories! If comedy's in you, this is the book for you! The UK has had many great moments in sitcom and to put it into quiz book is something that should have been done years ago, a great book. Where would we be without a sitcom? Well in that case this has got to be a must for parties and reviving our memories. The book is a wonderful idea, provided in a most professional format and well researched content of questions. The book should appeal to all ages, from the very young who may watch the sitcoms for the first time as classic TV sitcoms repeated on TV networks, to those of us who recall watching these programmes when they were broadcast for the very first time. The book appears to have all the ingredients to become a 'best-seller' and I do hope so as Chris Cowlin must have put a lot of time and effort into the book so I wish Chris and the book well. The book is for everybody old and young as there are questions from everybody's favourite shows, therefore a book for the whole family! It worries me how many of these questions I know the answer to ... Now I know why I’m not a millionaire … I’ve wasted my life watching TV sitcoms! Who said TV was bad for you? This book gave me hours of fun! Chris Cowlin has struck gold with his wonderful compilation of memory joggers covering almost 5 decades of British sitcom entertainment. When I started reading it, I asked myself ..."Do I really need to know all this?" By the time I had read a couple of pages not only had I answered my own question, but I was well and truly hooked! Thanks for this chance to reminisce on the golden days of Del Boy and Rodney, George and Mildred, Victor Meldrew and all the rest who made the British sitcom the envy of the world. A joy and an education from start to finish. This book is an invaluable resource for anyone fascinated by the world of the British sitcom. If you're into TV you'll definately be into this book, a great read and the memories came flooding back! 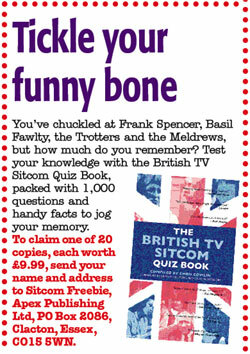 A quiz book full of nostalgia which takes you on a trip through TV history with a treasure trove of comedic miscellany. A must for TV lovers and quiz fans alike. If I ever became a contestant on Mastermind, my specialist subject would HAVE to be British TV Sitcoms. Being a competitive animal, I would of course have to swot up before taking part. I have found the perfect primer, The British TV Sitcom Quiz Book. Not only is it educational, it is a fountain of fun memories of all those happy half hours, from Hancock to Gavin and Stacey, from On The Buses to Dad's Army and every laugh in between. 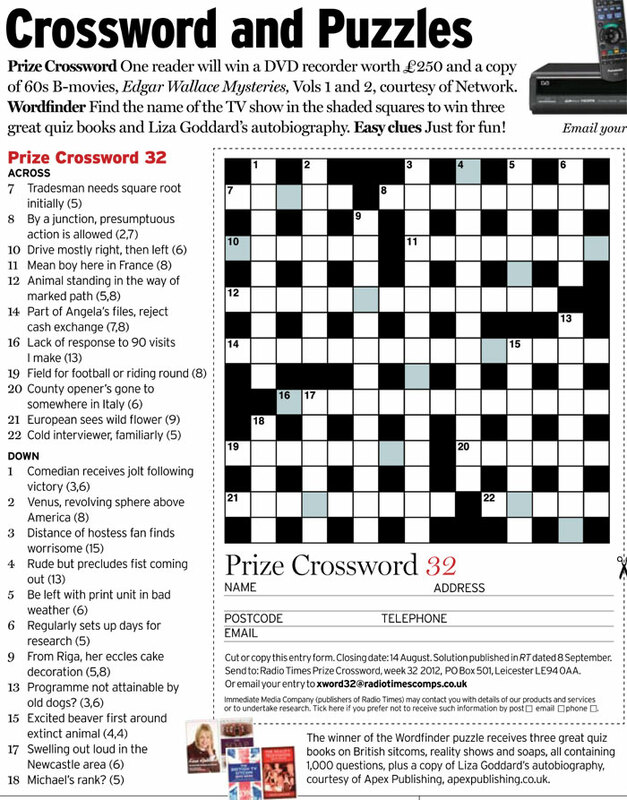 I'm off now, I am stumped by question 375 about Rising Damp : "What was the name of Rigsby's cat?" Perfect for those who think comedy is a serious business. This is a great book for all TV sitcom lovers. It might well jog your memory or stir up some memories of you and the family watching comedy at its very best. So relive the past and at the same time introduce others to the world of comedy. Excellent! A must for all telly addicts! Are you one of those people who sits glued to the televisiona nd never misses a TV sitcom? 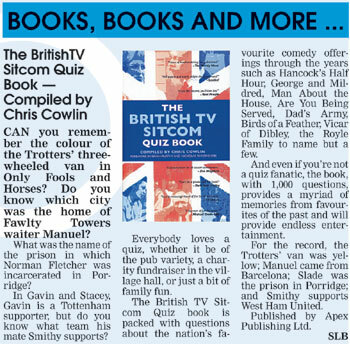 You now have the chance to check your knowledge against a fantastic new book called The British TV Sitcom Quiz Book by Chris Cowlin. You will find yourself goggle-eyed and fascinated with more questions and answers than you could have imagined possible. 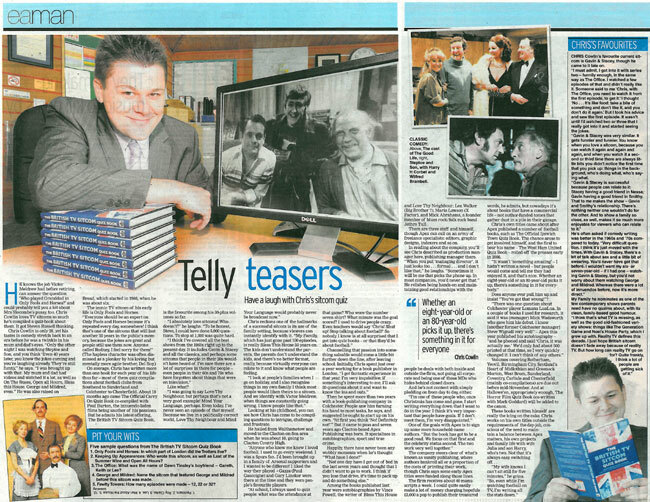 The book for all avid TV fans full of usefull TV knowledge. 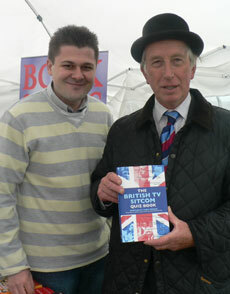 I really enjoyed looking though the book, the subjects are a good range of TV both old and new. Fascinating facts about your favourite funnies, everything you need to know about your favourite TV Sitcoms. A must for lovers of telly trivia! I had no idea there was so much to know about the wonderful sitcom world. I never knew Mrs Warboys had a first name, I thought her name was just Mrs.
Read this book, digest it, swallow it ... and no-one will ever know how you know so much about sitcoms. You'll be the friend they all want to phone when they need the name of George and Mildred's goldfish. You'll be able to tell them what Del Boy's son is called, where Hi de Hi was filmed, and what really happened to the Likely Lads. The world is your lobster! Informative, educational, entertaining and brilliant - a must have book for all TV Lovers. Reading it, you end up testing yourself, and others, while learning so much and being entertained, it's great fun! An ultimate compendium of British TV comedy. Great Questions that bought back some great memories. Thought you knew everything about sitcoms? This book will prove you wrong, honest! The most fascinating read since the Radio Times Christmas Special. 1000 questions, 1000 memories! Packed full of facts and memories of British TV gold. Brings back memories of some brilliant comedy shows – a must if you enjoy classic comedy. Think you know sitcoms? Think again! A must for any sitcom enthusiast. I was alarmed to discover I knew so many of the answers. Am I watching too much telly? The perfect accompaniament to take you through the commercial breaks. 21 December 2015 - Chris Cowlin was interviewed on BBC Radio Essex 95.3 FM. 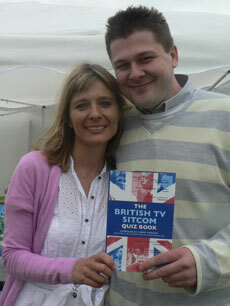 Chris answered questions about his book 'The British TV Sitcom Quiz Book'. Chris was interviewed on 'The Tony Fisher Show'. A great test for any television fan, fun for all the family. A fun book that all the family can enjoy. We took it to a family gathering and set up teams. Excellent front cover and very competitively priced at £9.99 for a hardback. It is very well presented and I think ten questions per sitcom is spot on and extremely useful for anyone organising a quiz or just for family get-togethers. This book is nostalgic and great entertainment and one I would certainly want and would give as a gift. An excellent ‘memory jogger’. Good job my life wasn’t dependent on answering all the questions, it brought back memories of some excellent acting, where have such entertaining programmes gone to? A well compiled quiz book. I have really enjoyed remembering the shows and some of the really good characters in them. I enjoyed reading through this book; it brought back many happy memories of the type of sitcoms we don’t see now. I am sure the questions will provide many entertaining hours! This book is great fun for all the family and as I love British comedy it is a really great read! It is good fun at a party and brings back memories of all the very funny British sitcoms. I thoroughly enjoyed this book; it definitely made me think carefully. Also, it was good for my memory as you do forget characters as the years roll on! I found this book most entertaining and very interesting and many of the questions ranged from hard/not so hard and easy. I will however use this book at family get-togethers, Christmas, etc. to test myself, family and friends of their knowledge, a great brain teaser if there was one. Certainly jolts the mind into action and reminds you of TV Programs in days of old, helping immensely with quiz programs! The book contains everything you need to know about old and new sitcoms. It taxes your brain to remember the answers to the oldest ones. Things you thought were long forgotten came to the surface. Little pieces of information stored away in your mind for future reference. A very interesting book. A very interesting and entertaining book - a must for Eggheads! This is a brilliant book and I would advise anyone who enjoys doing quizzes to buy it. It is full of all sorts of questions and if you don’t know the answers, there are pages at the back to look them up. It teaches you things you may not have known before and is very informative. It is suitable for all ages and covers all sorts of programmes. This book will be a great help to me when I want to find an answer to the quizzes that I do. A great resource for the TV addict and pub quiz compiler! Many hours can be whiled away browsing this interesting tome. 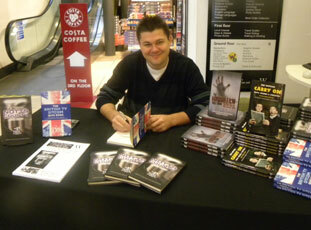 Chris Cowlin signed copies of his book 'The British TV Sitcom Quiz Book' and various other titles at Borders, Bullring Shopping Centre, Birmingham. 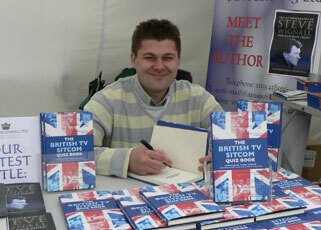 Chris Cowlin signed copies of his books 'The British TV Sitcom Quiz Book' and The Official Carry On Quiz Book' at Elstree Film Studios, Hertfordshire. 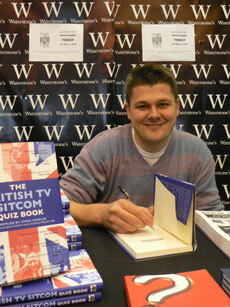 Chris Cowlin signed copies of his book 'The British TV Sitcom Quiz Book' at Waterstone's, Culver Sqaure, Colchester. 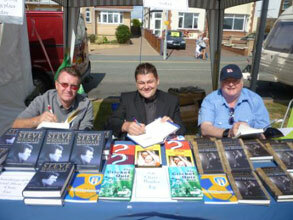 Chris Cowlin signed copies of his books including 'The British TV Sitcom Quiz Book', 'The West Ham United Quiz Book', 'The Official Colchester United Quiz Book' and various other quiz books at Clacton Air Show 2009. (Photo: Left: Former footballer Steve Wignall, centre: Chris Cowlin and right: Mick Abrahams, former founder member of Jethro Tull). Chris Cowlin signed copies of his books 'The British TV Sitcom Quiz Book', 'The Official Colchester United Quiz Book', 'The West Ham United Quiz Book' and 'The Gooners Quiz Book' at The Suffolk Show 2009. 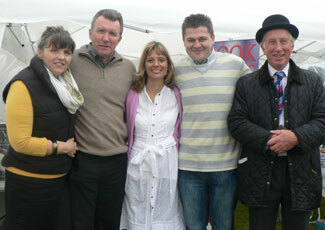 (Picture left: Anne Wignall, Steve Wignall, BBC Look East's weather presenter Julie Reinger, Chris Cowlin and unknown at The Suffolk Show 2009. Picture right: Chris Cowlin with Julie Reinger). 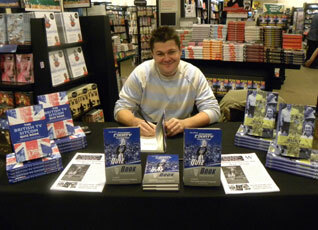 Chris Cowlin signed copies of his book 'The British TV Sitcom Quiz Book' and various other titles at Waterstone’s, Doncaster. 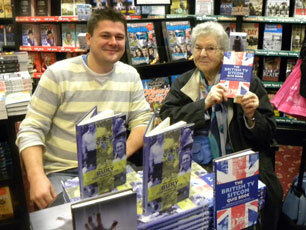 Chris Cowlin signed copies of his book 'The British TV Sitcom Quiz Book' and various other titles at Waterstone’s, Hull. 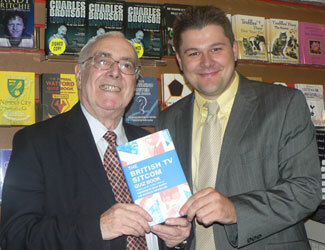 Chris Cowlin signed copies of his book 'The British TV Sitcom Quiz Book' and various other titles at Waterstone’s, Bridlesmith Gate, Nottingham. 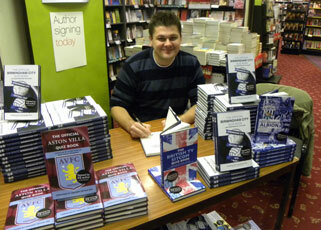 Chris Cowlin signed copies of his book 'The British TV Sitcom Quiz Book' and various other titles at Waterstone’s, Macclesfield. 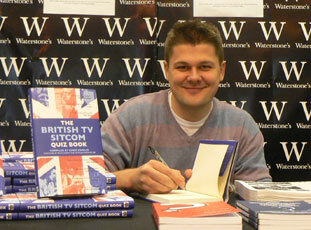 Chris Cowlin signed copies of his book 'The British TV Sitcom Quiz Book' and various other titles at Waterstone’s, Trafford Centre, Manchester. 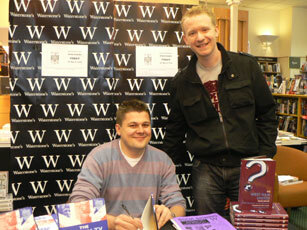 Chris Cowlin signed copies of his book 'The British TV Sitcom Quiz Book' and various other titles at Waterstone’s, Bury. 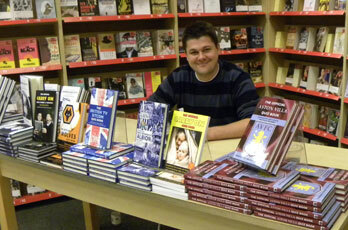 Chris Cowlin signed copies of his book 'The British TV Sitcom Quiz Book' and various other titles at Waterstone's, Solihull. 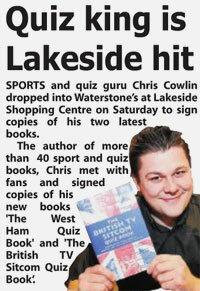 6 November 2010 - Chris Cowlin signed copies of his book 'The British TV Sitcom Quiz Book' at Waterstone's, Meadowhall Park Lane, Sheffield.